Borax, also known (most predominately in the way we’re talking about right now) as sodium tetraborate, is a boron mineral and salt that’s mined directly from the ground. Boron is an essential mineral that the body needs for bone building, immune function, and brain function. Plants need it to grow. But, like anything, it’s needed in small moderation. Much like salt. Boron is found aplenty in borax. People even take borax as a supplement and swear by it (I am NOT recommending you do this). That’s a little extreme, but I use it as a gauge as to how harmful borax really is. 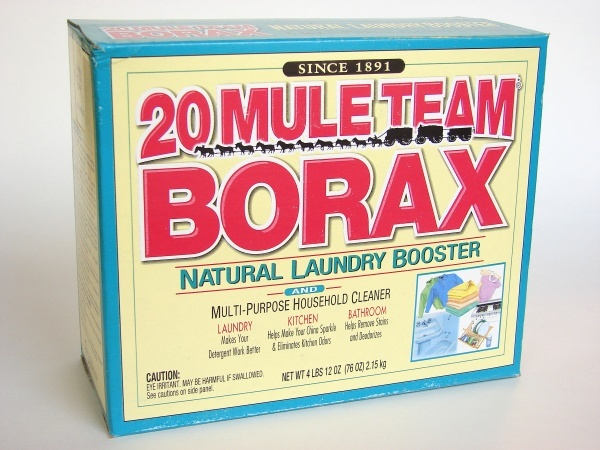 For me – and this is my personal determination after months of searching, wondering, and compiling information – borax is just fine to use in my household cleaning routine. ESPECIALLY as a laundry detergent. It’s also fine to use, occasionally, as a hair treatment … or even in a lotion. I’ll just be keeping it out of the reach of kids and my two cats. Not that any of those beings would want to eat it anyway. Ick.